UPDATE ONE: A change has been made at the last minute to the official Atlas Steam Early Access launch. Studio Wildcard has been forced to delay the Atlas game release date, although, no details have been given on why. The launch has now been pushed back until Friday, December 21, with a new countdown timer expected to be revealed soon. A message from the community team confirms that the developers behind the ambitious online game will be working through the next 48-hours to ensure that Atlas isn’t delayed again and arrives on the new launch date. ORIGINAL: The new Atlas game from the makers of ARK Survival Evolved is launching today on PC. The Steam Early Access game is only releasing on one platform today and will likely not reach others for a long time. It follows in the footsteps of ARK Survival Evolved, a game that has proven a massive success on PS4, Xbox One and PC. And it won’t be long before fans get their chance at playing the latest creation from Studio Wildcard. There has been some confusion over when the Atlas release time would fall on December 19. Having seen the game delayed earlier this month, there have been differing information shared on the Steam page and Atlas game website. From what we know so far, it appears that the Atlas release time on Steam Early Access has been set for 11pm, GMT. It’s unclear just how Studio Wildcard will handle the launch, if it will be a gradual rollout, or based on regional location. Atlas will cost less during its early access phase, which is scheduled to last two years on PC. “ATLAS is one of the most ambitious online worlds of all time and while everything we have listed in the feature section will be there around Early Access launch, we are going to need the feedback, insight, and creativity of the game players to build on that foundation and balance the game optimally over a period of time,” a dev message explains. While it may look a lot like ARK Survival Evolved, there is one massive difference that fans will notice straight away. Atlas will be a game which will not boast lots of smaller servers but will instead be hosted on a massive scale. There will be an option to play on PvP or PvE servers; however, it sounds like there will only be two choices at launch. Studio Wildcard says that Atlas will host up to 40,000 players exploring the same Globe simultaneously. 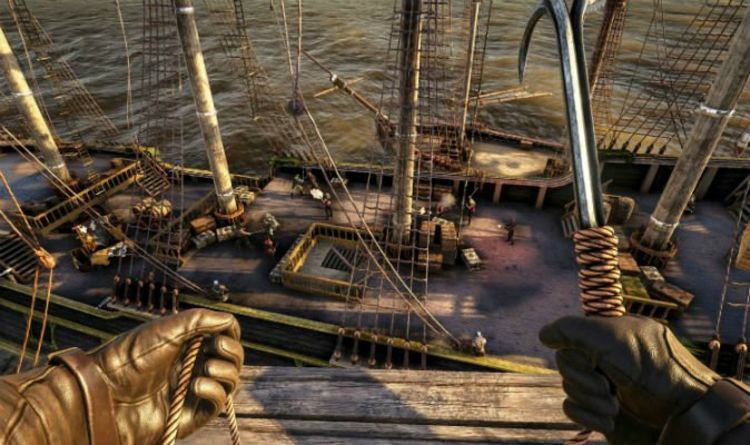 This will be based around ship-building at pirate warfare at first, but fans can probably expect the experience to change significantly over time. And from what has been shared about the game so far, players will also be able to rely on help from NPCs, rather than taming beasts. “Stake your claim in this endless open world as you conquer territory, construct ships, search for buried treasure, assemble forts, plunder settlements and hire crew to join your powerful growing armada. “Start small then expand your spheres of influence from a small island, up to an unstoppable pirate empire that spans across the oceans. Wage battle against enemy fleets as you singlehandedly command large ships of war using the captaining system (or divide up to the responsibilities among your trusted lieutenants), or take control of any weapon directly with your own character. “Dive deep into the briny water to explore permanent sunken wrecks and recover salvage, unearth the loot from procedurally-generated Treasure Maps and challenge zones, or complete challenging main questlines. “Team up with other aspiring adventurers and sail into the vast ocean to discover new lands rich with region-specific elements, tame exotic natural and mythical creatures, raid forgotten tombs, confront powerful ancient gods and even build and administer your own colonies, cities, and civilizations to dominate the ATLAS in this ultimate quest for fortune and glory! Atlas will also draw a lot from ARK Survival Evolved, offering players the choice of taming animals, as well as battle massive monsters. Players will also be able to build bases on lands as an alternative to owning ships on the sea. Explorers will voyage to over 700 unique landmasses across 45,000 square kilometres, with thousands of Discovery Zones, and ten distinct world regions each having their own unique resources, creatures, secrets, and environmental hazards.